It was the most amazing thing I've ever seen. I've never seen a volcano erupt and it was spewing lava and ash hundreds of meters into the air. Lightning was striking down at the volcano from the ash cloud that formed from the eruption. Local authorities were well-aware of the dangers the famous volcano posed, and they began issuing warnings to evacuate on Monday. Around 3,500 people have been evacuated thus far, Interior and Security Minister Rodrigo Penailillo told the AP. These proactive safety measures have benefited nearby residents, as there have been no injuries reported yet, despite the highly volatile situation at hand. 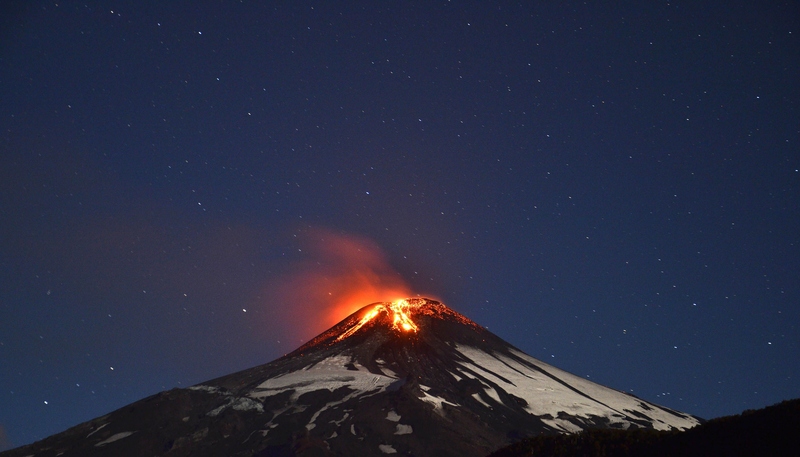 Still, officials remain on high alert, as Villarrica sits beneath a 15-square-mile ice cap, but as the heat from the erupting volcano causes the ice and snow to melt, many surrounding communities might be adversely affected by dangerous mudslides. Rodrigo Alvarez, director of the National Service of Geology and Mining, warned residents and tourists not to be fooled by the awe-inspiring nature of the spectacle, reminding them of the very real dangers that remain in place. Alvarez said, "This is not a fireworks show. It's an unstable volcano, all of its borders are altered." Rising river levels have left some 200 people stranded in nearby towns, and an agricultural emergency has been declared on behalf of affected local farmers. Most problematic is the lack of water that has resulted from the blast, with some 15,000 individuals in rural villages suffering shortages. But as for Pucón itself, much of the small city's day-to-day activity had returned to normal by noon, with much of the earlier drama nearly forgotten. As incredible as this eruption may have seemed, experts consider this to be rather low-impact as far as volcanoes go, calling it a "stromboli eruption," one that "only" sends lava and other volcanic material some five kilometers into the sky. Still, despite the relatively tranquil aftermath of the initial explosions, Chilean President Michelle Bachelet pledged vigilance in handling the volcano, saying, "I am calling for calm. We are monitoring and evaluating the situation closely." Villarrica is a popular tourist destination, with hundreds of hikers frequenting the peak every year to visit the lava lake that has formed as a result of its numerous eruptions.